This meal isn’t something that would make me want to barf, per se (see mushrooms), but it’s definitely something I simply never order. The cheesy carbs: yes. The vegs: yes. 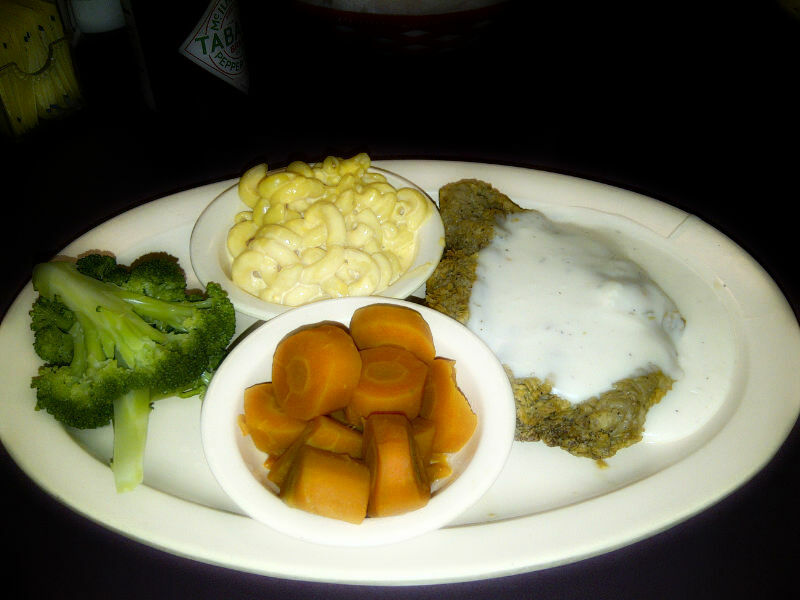 The thickly-breaded then deep fried cube steak smothered in white gravy? Which is weird, because I like breading, I like deep fried, I even like a chewy, thready cube steak every now and then. But the combo–along with the rather anemic-looking gray–just isn’t my cup of tea. Maybe it’s a regional thing. Growing up in my California home, we didn’t see a lot of this kind of southern comfort food. And that’s probably a shame. Luckily, 11 years in Texas has help broaden my southern cuisine palette. On the upside, I went here to use my nearly-expired Groupon, redeeming it for chicken spaghetti and four pieces of pie. (Shut-up, don’t judge me.) So as it turned out, I had a great day after all.